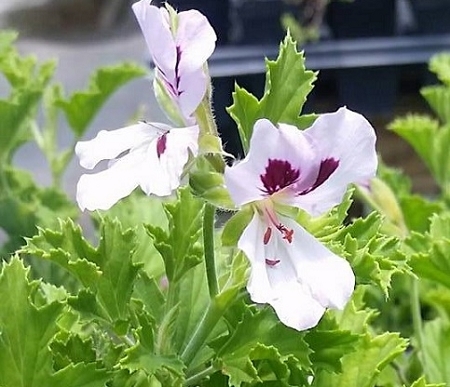 Prince of Orange Scented Geranium (p. prince of orange) - Beautiful scented leaf geranium features large blooms that are white/lght pink with dark maroon markings. Citrus scented leaves can be used for culinary purposes. Requires sunlight and a well drained soil. Excellent container plant. Perennial zones 10-11+ Live plant in 3" container.